Suzuki’s big sales pitch for the GSX-S1000F was that it shared an engine with the much-loved and hugely successful 2005 GSX-R1000 K5. So what better way to see just how close the two distant relatives are than a blast down Bruntingthorpe’s two-mile runway? And, just for fun, I also compared it to the 2015 GSX-R1000. We obviously knew my GSX-S would be down on top speed, but a true 157mph is respectable. It’s not restricted and was bouncing off the rev limiter at the end of the two-mile straight, where it was reading 167mph on the speedo. Acceleration times are impressive in comparison to Suzuki’s latest sportsbike. The GSX-S is less than half-a-second slower than the current GSX-R over a standing quarter-mile. The GSX-S is easy to get off the line and it’s the only bike of the three to come with traction control as standard, making it even easier in tricky conditions. To 100mph there’s less than half-a-second between the three bikes; in actual measurement less than two metres, which means at 100mph the GSX-S is right on the back wheel of the modern GSX-R – again, not bad for a sports touring bike. However, after 100mph the gap starts to increase. At 140mph there is a visible gap and the GSX-S is two seconds behind the new GSX-R. It just hasn’t got the power to keep cutting through the wind at high speeds. For example it takes the GSX-S 11.84 seconds to reach 140mph, by which time the new GSX-R is doing 153mph. The top gear roll-on figures for up to 100mph are also impressive and the GSX-S is not far behind either GSX-R. This equates to a useable road bike, good roll-on power and rapid acceleration to 100mph. The last measurement involves the brakes, which are a little disappointing. 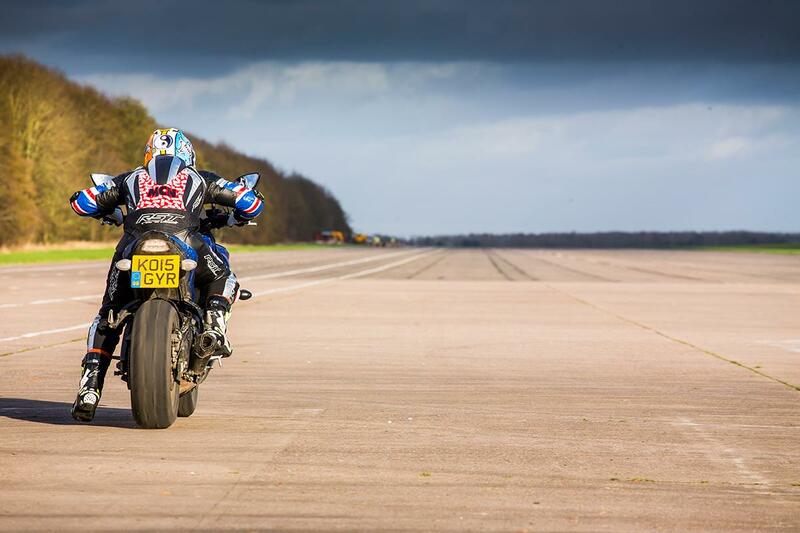 The ABS Brembo stoppers took 53.59 metres to haul the GSX-S up from 70mph to a standstill. However its pads and discs have done 8000 miles. Still, this was an interesting and fun test which scientifically shows how impressive the GSX-S is. Performance up to 100mph is nearly on par with the latest sportsbike and roll-on power in top gear is equally impressive.